A graffiti style picture of the flag of United Kingdom. I based the starburst design on a superhero comic fight scene star, which would usually say, pow, kapow, boom etc. 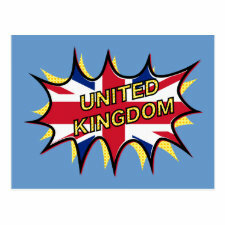 The word United Kingdom is written in comic style yellow dots. The Union Jack featuring cockney rhyming slang. There designs are on more products at my piedaydesigns store. Design your own picture postcards on zazzle. Try Zazzle's custom postcards printing.